The Jerry Litton Fund for Agricultural Leadership will have several components: The Litton Lectureship will bring interesting speakers to campus. The Litton Fellowship will support faculty entrepreneurial activities. The Litton Scholarship will encourage top students to develop their leadership potential. Finally, the Litton Agricultural Leadership Fellowship will help students to gain farm policymaking experience. The $250,000 fund, announced October 20, 2010, was endowed by the Jerry Litton Family Memorial Foundation. The foundation supports agricultural, educational and athletic activities in memory of the Jerry Litton family. The primary focus is given to Chillicothe and Livingston County, but support may be provided to other qualified projects within the state. Edwin S. Turner, college fraternity brother and Vice President of the Jerry Litton Family Memorial Foundation, recalled the University's impact on the life of his friend. "The University of Missouri played a very important role in shaping Congressman Litton's career," he said. "His unparalleled leadership skills were further developed as he participated in many on-campus activities. The resources offered by the University were equally invaluable to the incredible success of the Litton Charolais Ranch. Even though Jerry's life tragically ended at a very young age, he became known both nationally and internationally as an innovative spokesman for agriculture. It is only fitting that The Jerry Litton Fund for Agricultural Leadership be established at the University." 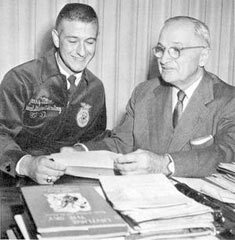 CAPTION: In 1965, Jerry Litton had the honor of visiting with President Harry S. Truman to extend an invitation to the former president to speak at the FFA convention. Jerry remembered that instead of his original 15-minute appointment, Mr. Truman devoted nearly two hours to "selling" him on the importance of people participating in politics and running for public office.